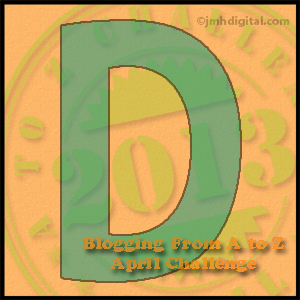 As I tossed around all the “D” topics I could write about on this fourth day of the A to Z blogging challenge, it dawned on me that my favorite “D” topic in all the world is my two dear, daring, dramatic, dancer, distinct, dreamer, doer, darling daughters. I am a truly blessed mother. Back in the day, before motherhood I’d heard people tell me how much I would love my children one day. I couldn’t fathom the love I have for them back then. But it is true, my love overflows for them.Sure I may yell and complain when they spill an entire carton of cottage cheese upside down on the bathroom floor or refuse to eat the supper I made or leave their toys where I can trip on them or bicker with each other over what show to watch in the end I love them more than I can express. They are so much more than just their short-comings and so am I. My daughters make my life brighter each and every day. Whether the the sun is shining and everyone is smiling or dreary clouds hang above and I’m feeling depressed, thinking about them and the little things they do always brings a smile to my lips — like the way my oldest daughter comforts and protects her little sister who is afraid to go to school or the smile on youngest daughter’s face as she realizes she can read a book all by herself. I feel their joys and accomplishments as well as their pain and suffering. Through their tears and smiles or mine, we always seem to find find our loving arms around each other. We are all learning, growing and living. I am so proud to be their mother and with God’s grace and guidance I hope some day as they look back on their childhoods that they will be proud to have me as their mother. I’ve heard it said I’ll love my grandchildren even more than I love my children, right now I don’t see how that is possible, but time will tell.